A report of a shooting in the Bent Tree Apartments on the 3400 block of Providence Drive north of Winchester Road came to the Memphis Police Department’s Raines Road station at 9:30 a.m. on Friday, November 16, 2018. Officers arrived to find three unresponsive males lying on the floor of a residence and suffering from apparent gunshot wounds. The three — identified as Mujahad Muhammed, Kevin McNeil, and Mohamed Kane — all were pronounced dead at the scene by Memphis Fire Department personnel. Officers learned that friends had gone to check on one of the men in the apartment and found the three on the floor. No other information, including time of the shootings, was available. Investigators need help solving this triple homicide. Anyone with helpful information should call CrimeStoppers, 528-CASH (2274). It was approximately 2 p.m. Sunday, November 11, 2018 when Memphis Police officers from the Airways station officers responded to a shooting call at Pendleton Street and Burns Avenue, near the Orange Mound neighborhood. At the scene officers found a victim lying on the sidewalk and suffering from an apparent gunshot wound. The unidentified victim was pronounced dead on the scene by Memphis Fire Department personnel. A suspect’s description is available. The man is, described as black, five feet eight inches, 160 pounds, 27-30 years old. He was wearing dark clothing and shoulder length dreads. Anyone with information that might help solve this murder is asked to call CrimeStoppers at (901) 528-CASH (2274). It was about 9 p.m. on Tuesday, October 23, 2018 when MPD officers working at the Crump station reached the scene of a reported shooting in the 800 block of Edith Avenue, near Mississippi Boulevard and E. McLemore Avenue. After arriving officers located two people suffering from gunshot wounds. Terrence Bowen was transported to Regional One where he later was pronounced dead. A second victim was transported to the hospital in critical condition. Officers learned that after the shooting one or more suspects left on foot. Because no other information was available, investigators need the public’s help to solve this crime. Anyone with information action is asked to contact CrimeStoppers, (901) 528-CASH (2274). Memphis Police responded to a shooting call at 1:03 p.m. Sunday, October 21, 2017 in the 4300 block of Old Raleigh LaGrange Road. At the scene officers found Saul Rentario on the ground. He was suffering an apparent gunshot wound and was unresponsive. Rentaria was pronounced dead on the scene by Memphis Fire Department personnel. A initial investigation determined that Rentaria was approached by a black vehicle occupied by two male blacks. One of the two exited the vehicle, armed with a black handgun, and approached Rentaria demanding money. Rentaria fled and was shot by the suspect, who got back into the vehicle which drove away. Anyone with information on this crime is asked to contact CrimeStoppers, (901) 528-CASH (2274). Editor’s note: We are highlighting this week a homicide from nearly two years ago. The victim’s parents have asked Sonya Marquez, a supervisor with the MPD’s Real Time Crime Center and our liaison with the Albuquerque, New Mexico Police Department, to put a renewed spotlight on this case, and we are happy to do so. It was at 3:26 in the afternoon of Saturday, February 11, 2017 when Memphis Police officers were called to the Nonconnah Creek just north of 2891 Lakeview Road. On arrival the officers found a body in the creek. 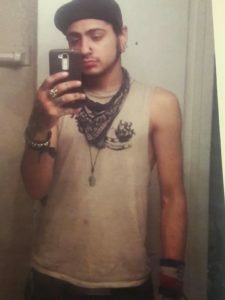 The victim later, whose body had been in the creek for several days, was identified as Dominic Castillo, 22 of Albuquerque, New Mexico. Authorities ruled his death a homicide. It was learned that Castillo had been on a backpacking trip across the country. He arrived in Memphis on January 22, 2017, and was last known to have been in the downtown area. 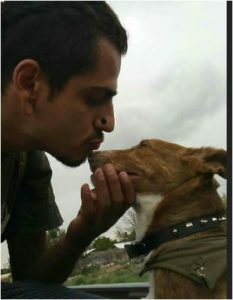 Castillo was carrying a backpack and was accompanied on his hike by a brown, three-legged dog, which hasn’t been seen. Anyone with information that could help solve this murder is asked to contact CrimeStoppers, by phone (901) 528-CASH (2274), or by text or secure email: crimestopmem.org/tips/. It was the morning hours of Monday, October 15, 2018 when a call came in to Memphis Police at the Crump Blvd. Station that a person was seen lying on the ground in the 200 block of Richmond Avenue, just west of Mississippi Blvd in South Memphis. Arriving officers found an African American female in a field off the street. Memphis Fire Dept. paramedics were called to the scene and pronounced the woman dead. The victim later was identified as Ester Tucker and her death was ruled a homicide by the Shelby County Medical Examiner’s office. This case now is an ongoing homicide investigation and authorities need helping solving it. Anyone with information is asked to call CrimeStoppers, (90-1) 528-CASH (2274). Memphis Police Officers from the Ridgeway Station responded to a report of shots fired in the early morning hours of Sunday, October 7, 2018. They arrived in the 3300 block of South Woodlake Circle, just east of Tchulahoma Rd. And south of Winchester Road, to find Maria Barton. She was unresponsive inside her 2012 black Ford Focus, and suffering from at least one gunshot wound. Memphis Fire Dept. paramedics arrived and pronounced the victim dead on the scene. Her purse and several personal items were on the ground near the car. Detectives are asking for help in solving this murder and apparent armed robbery. Anyone with information is asked to contact CrimeStoppers, (901) 528-CASH (2274). During the early morning hours of Sunday, September 30, 2018 William Talley was shot in the 2800 block of Summit Arbor Circle north of Raleigh-LaGrange Road. Police were called by a passerby and Talley was pronounced dead. A preliminary investigation showed that Talley was sitting in a car when he was approached by a black male wearing a white t-shirt and blue jeans, with a black or brown bandana covering his face. The suspect shot Talley and fled. Detectives need help solving this homicide. Anyone with information is asked to call CrimeStoppers, 528-CASH (2274). A report of a shooting brought Memphis Police officers to the intersection of Kaye and White Station roads Sunday evening, September 23, 2018. Officers arrived and found an unresponsive black male lying in the roadway. He was suffering from an apparent gunshot wound. Memphis Fire Department paramedics pronounced the victim dead at the scene. Suspects were last seen occupying a four-door white vehicle and traveling southbound on White Station, according to potential witnesses. The victim has been identified as Jerald Holiday Jr. No other information was available to police and investigators need help. Anyone with information is asked to contact CrimeStoppers, 528-CASH (2274). A Memphis Police officer on routine patrol at 1:32 a.m. Sunday, September 9, 2018 spotted a suspicious vehicle parked at the gas pumps at the Exxon service station at 4675 South Third St. The officer investigated and found a large amount of blood in the vehicle and a blood trail leading away. Help was called and after an extensive search a man’s body was found in a nearby wooded area. The victim, Prentice Pleas, apparently suffered a gunshot wound and fled the scene on foot until he collapsed. Pleas was pronounced dead by Memphis Fire Department paramedics. A male black individual traveling on foot may be involved in this incident. Anyone with information that could help solve this homicide is asked to contact CrimeStoppers, 528-CASH (2274).